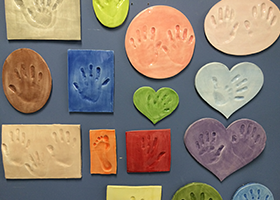 Paint your own pottery and more, with NO studio fees and NO reservations required! We are open Monday-Wednesday 10-6, Thursday 10-9, Friday-Saturday 10-6 and Sunday 12-6. Walk-ins are welcome when we are open to the public. Explore Your Creative Side With Us! When you want to create a unique gift, spend quality time with friends or expand your artistic horizons, Do*It*Yourself Crafts is the place for you! 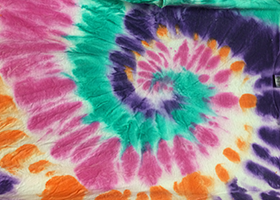 We offer many different crafts for you to enjoy, from pottery painting and glass fusing to tie-dying. We’ll help you pick out your project through to guide you to the completion of your masterpiece. 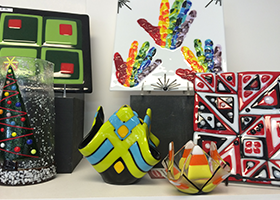 Our regular offerings include Glass Fusing, Paint-Your-Own-Pottery, Tie-Dye, clay plaques, canvas painting and More! To find out more about what’s new and exciting in our shop, please click here to view our blog. Do*It*Yourself Crafts is a place for gathering with friends. We offer both parties and classes that make learning as a group fun. Book a birthday party, or a group event, and choose a craft class from one of the events listed on our Parties page. All that's left is to invite your friends. We'll take care of the supplies and items needed to accommodate your group. We have classes for children and adults alike. Do*It*Yourself Crafts is a wonderful place to discover the artist inside of you! Come enjoy a day with friends and family, creating a one-of-a-kind gift, or celebrate a special holiday or occasion. Some items go home the same day, and some items you pick up the following week. Prices are all-inclusive and vary depending on the project you choose. Walk-ins are welcome. Call today to register for a class, book a party or to receive more information. We have board art now! Welcome signs, inspirational quotes, city icons, and more can be hand painted onto our precut boards and personalized for your home. We will show you how to do it all right here in the store. We have a large variety of templates for you to work with and we are constantly adding new ones. These go home with you the day you make them! It's time to order your custom pumpkin! We are so excited to offer these again this year! You can order yours for $65, which includes the custom carving of a name up to 10 letters long (first or last - your choice! ), painting, glazing and firing, plus a light kit so no candle needed! Click here to place your order. Pumpkins will be ready in 3-4 weeks. Yep! We have them! We have a limited selection available for walk-in painting, but we'll have several events in October and November for you to order your tree just like grandma had.